As many educators are finding, they are increasingly required to track student data. 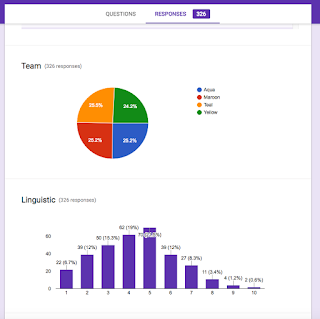 Whether it is behavioral or academic data, Google Forms and Sheets can handle it easily. You don't even need to be a spreadsheet expert to analyze the data. Begin by creating a Google Form in Drive. If you are tracking behavioral data on a student, create a question to identify the date of observation. Although every submission is automatically time-stamped, you may want to be able to add your submissions on your own timeframe. Add a few linear scale questions to rate the behavioral traits and your form is complete. If you would like to make your form more complex, then by all means continue to add questions and variables that you may want to be able to filter by later. Now that the form is created, send yourself or an instructional assistant the link to the form so they can save it to the device from which they will be entering submissions. Each time you open that link you will be presented with a blank form ready for data submission. As you can see from the screenshots above, Google Forms will create its own graphical analysis of the data submitted under the Responses tab. If you'd rather see the entire data set in the spreadsheet of responses, navigate to the Sheet and click on the Explore button in the lower, right-hand corner and, once again, Google will automatically create its own graphical analysis of the data submitted. Most often, these graphs that are created are more than sufficient for discussion at a team or parent meeting.